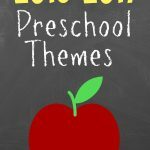 After planning out preschool themes for the year, It’s time to get started planning out your weekly lesson plans. The easiest way I have found to plan out the preschool week is to use a weekly preschool planner. 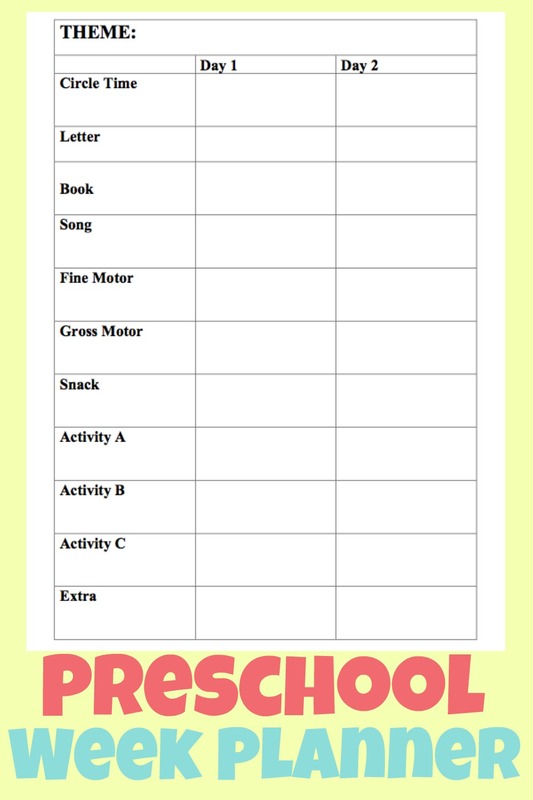 Not only will this help you to have an easy outline to plan your day, but your preschooler will also benefit from having a consistent preschool routine. I have created a simple and easy to use two-day a week lesson planner I would like to share with you. I have found that planning out two days a week works really well for my family. It gives us time to cover our weekly topic but isn’t super overwhelming to plan. Plus, it still leaves plenty of time during the week for unstructured play, enrichment programs and field trips. 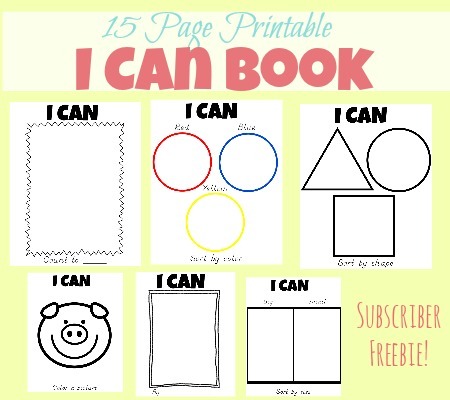 The planner may appear simple at first glance, but I think you will find that it has everything you would want to include in your preschool day. I’m going to walk you through each category of the planner just to give you a feel of what kind of activities I like to schedule in for each category. I hope that you will find it helpful as you look for ideas and plan out your own weekly lessons. After printing out the weekly planner, write the week’s theme to the top of the page. If you have already planned out your themes for the year this is a super simple step. If you haven’t, you might want to use this weekly themes planner to preplan your themes for the year. Planning out the themes all at once is super nice because then you know you will cover all the topics you want to in a year and you never have to wonder what to learn about next. Sometimes, I also like to plan subtopics for each day too. For example, for the first week this year our topic is me and my family. So for the first day, I plan on having the subtopic be all about me and on day two we will focus on my home. I just write the subtopics in the boxes that say day 1 and day 2. During circle time you can go over the calendar, weather and days of the week. This is also a great time to say the pledge of allegiance together. I also like to have my children write in their gratitude journals something they are thankful for and illustrate it. During this time, you can also introduce the theme for the week or day. It is a great time to just sit with your kids and discuss and learn together about your topic. If there is any specific information you want to share with them or resources you want to use to teach them, plan it here. Each day you can plan a letter to focus on. In the past, I have focused on just one letter each week and introduced the letter the first day and then reviewed it the next. We would learn the letter name, look at pictures of things that started with that letter and learn the letter sound. However, this year my son is a little older and knows most of the letters already. So we will instead be working more on reviewing the letter sounds and learning to write them. Is there anything better than reading a great book with your kids? With so many awesome children’s books to choose from, it can be hard to narrow your choice down. Trust me, I get it, the struggle is real. I overcome it by planning a book for each day that fits our subtopic. Then, I also gather up as many books as I can on our topic and place them in a book basket. That way you can grab and read them whenever you want to throughout the week. Kids love music and it is a great tool to help them learn. You can find great kids songs online to fit almost any theme. Next on the plan is a fine motor activity. This can be anything from a craft, tracing practice, scissor skills or playing with playdough. Anything that helps them improve their fine motor skills is a great choice. 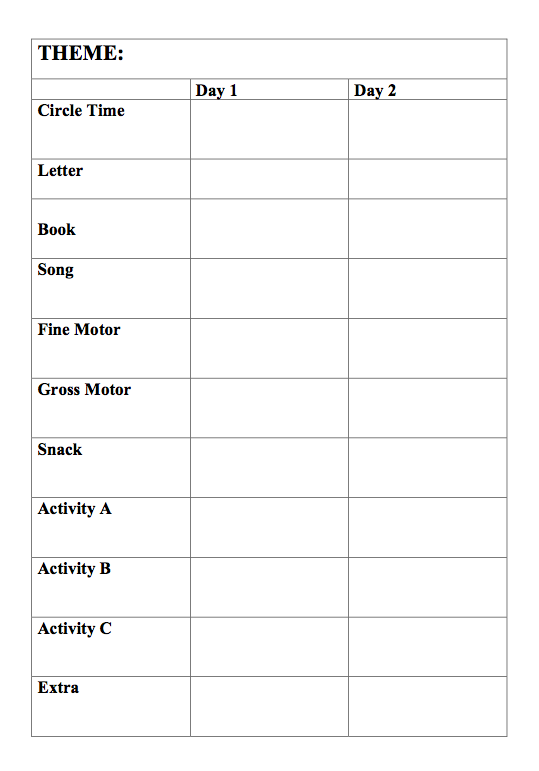 The gross motor category is the place to plan an activity that will get your kids up and moving. Some fun choices are movement cards, songs with actions, relays, physical games and nature walks. You can use this category to plan a cute snack related to your theme. I try and do this sometimes but, most of the time, I just try and plan a simple healthy snack. The activities can be anything you want to plan for the day. 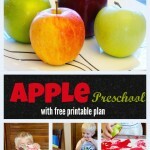 This is where you can add fun activities or crafts that relate to your theme. You can do worksheets, but I mostly like to keep the activities more hands-on and engaging. Don’t feel like these need to be big projects either . For a unit on trains, an activity could be playing with toy trains or putting together a train theme puzzle. I like to focus the activities around the topic if I can, but you certainly don’t have too. The extra spot on the planner is a place to make note of any fun extras you might want to do during the week. If there is a fun field trip you would like to plan or a movie that you want to watch this where you can plan that in. 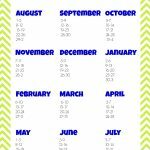 I hope that this planner will make it easy for you to plan out your preschool week and that you will have an amazing time learning with your children. Feel free to download a copy of the planner by clicking the link below. Enjoy!